and not reusing the enums). It looks like backwards in this context means smallest to largest? Roughly, yes, it goes smallest to largest, but with the default TieredMergePolicy, the segment sizes can vary a lot over time (it doesn't care about / preserve segment order in the index). I think the idea was also that it is frequent to have a lots of documents that are pretty static and a few ones that are frequently updated, and these frequently updated documents would more likely be in the last segments? OK, I'll switch it to go backwards again. 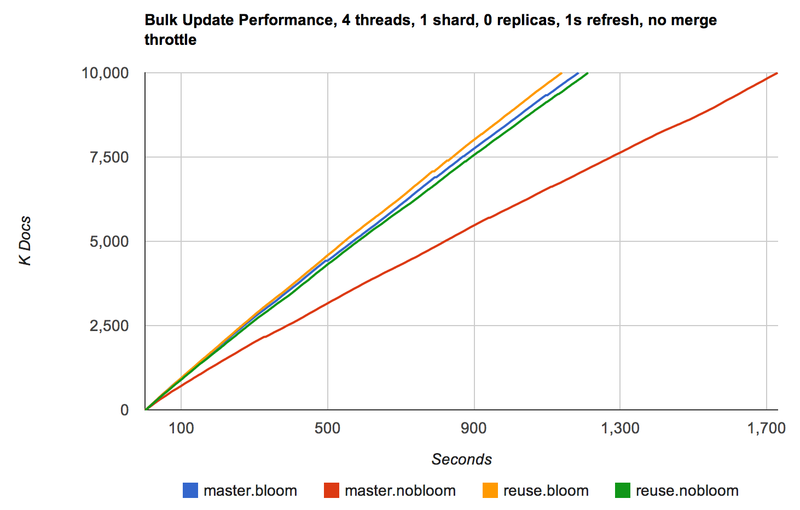 I ran a bulk indexing perf test comparing master vs this patch, updating 10M small log-entry type docs ("index" command, passing _id), with random UUIDs (%10d, worst case for terms dict), using MMapDir, and the results look promising: reusing the TermsEnum gets back much of the performance that bloom filters buy us today. It makes sense to me given the minor speedup they bring. But maybe as a separate change? +1 for separate issue, I'll open it. I want to test a larger index, and a cold index first. Separately I'm going to test switching to the new IDVPostingsFormat. OK I went back to searching segments in reverse order, and downgraded the other nocommits to TODOs. I think this is ready; I'll commit soon. Can you just remove this commented line before pushing? them back, it can just update the index.codec.bloom.load to true.